Ruby is one of four juvenile peregrines bred in captivity and released to the wild at Charleston Lake in Eastern Ontario's Leeds County in the summer of 2001. After flying for a week, Ruby was recaptured to be fitted with a transmitter for participation in Project Track-'em. Ruby was the first peregrine from a hack release on a cliff to be studied via satellite telemetry, and her travels provided us with valuable insights into peregrine behaviour. For approximately ten months, Ruby's transmitter provided information on her position every four to five days, as summarized in the map below and the reports which follow. Apr 30, 2002: Gananoque. Ruby has "graduated" from Project Track-'em and is now winging her way around Ontario (or elsewhere) in anonymity! A few days ago she was captured in Trenton during the course of some routine bird control efforts at the military airport. We were notified immediately, and decided that her transmitter should be removed at this point. Though the battery in her transmitter continued to function well, chances are it would have failed within the next couple of months. While it would have been interesting and valuable to track her during this time, chances are high that she would have eventually "disappeared" when the battery fell silent, as some of the other peregrines in the program have done. The transmitter would have fallen off, so Ruby would not have been wearing it much longer anyway, but the advantage of recovering it now is that we can refurbish this transmitter at minimal cost and put it on a different bird for next fall, adding an extra individual to our study's sample size. After having her transmitter removed, Ruby has examined, and found to be in excellent health (definitely very feisty!). In the hopes of keeping her from getting caught at Trenton again, she was brought back east by Gary Nielsen and Dwayne Struthers to Gananoque for release - in the same region as the Charleston Lake site where she was released last summer, but far enough away that she is unlikely to interfere with this year's planned release at the same location. Chances are that she will not linger in the area anyway, but rather will continue to roam in search of a permanent territory. From now on, we will be relying on visual confirmations of her leg band for any future information about Ruby's whereabouts - any potential sightings are welcome at marcel@peregrine-foundation.ca. There is no way of knowing where she will spend next winter, but just in case she does return to the same area of New York City that she occupied this past winter, we will ask our friends in the area to keep an eye out for her and inform us of any sightings there. Apr 22, 2002: 44.1N, 77.6W (Trenton, Ontario). After almost returning home, Ruby has continued wandering. Today she reported to us from Trenton, Ontario, roughly halfway between Kingston and Toronto along the north shore of Lake Ontario. Apr 18, 2002: 44.7N, 75.6W (Brockville, Ontario). There's no denying that Ruby's location tonight comes as an absolute shock. 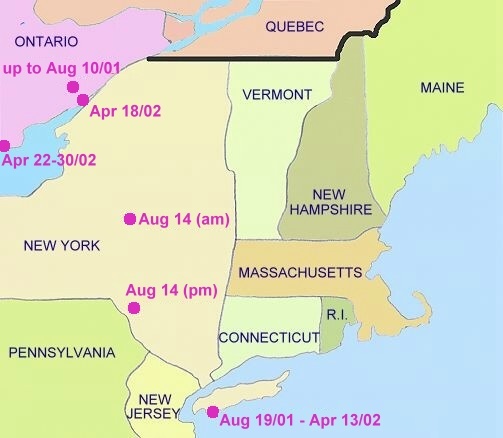 For nearly eight full months, she was faithful to a small area of southwestern Long Island, and having shown no inclination to wander more widely when nearby peregrines began nesting in March, it seemed likely that she had decided to remain in the New York City area. Yet tonight she is back in Ontario, roughly 5 kilometres north of Brockville, and only 35 kilometres northeast of the cliff where she was released at Charleston Lake last July! A remarkable turn of events - it will be interesting to see now whether Ruby heads all the way home, or chooses to settle elsewhere in the region instead. The timing of Ruby's migration may not be entirely coincidental - the past 3-4 days in the eastern United States and Canada have been extremely warm (record-setting in many areas) and a flood of migrant birds of all kinds have moved north with this weather system. Apr 13, 2002: 40.6N, 73.8W (Long Island, New York). Ruby again is reporting from her usual area of Long Island. Apr 9, 2002: 40.6N, 73.8W (Long Island, New York). Another report from Ruby's usual location by Jamaica Bay. Apr 4, 2002: 40.6N, 73.7W (Long Island, New York). For a change Ruby's location is again slightly to the east, but she remains essentially in the same area. Mar 26, 2002: 40.6N, 73.8W (Long Island, New York). A very strong signal from Ruby tonight confirmed that she remains in her usual location. Mar 21, 2002: 40.6N, 73.8W (Long Island, New York). Ruby is again in her normal area on the east side of Jamaica Bay. Since many peregrines in New York State are already nesting, it seems likely that Ruby has either settled down with a mate in this area, or has decided not to attempt to raise a family until she is a full adult next spring. Mar 17, 2002: 40.6N, 73.9W (Long Island, New York). Today Ruby is back over on the west side of Jamaica Bay. Mar 11, 2002: 40.6N, 73.8W (Long Island, New York). Once again, Ruby is in the area she has occupied since last August. Mar 7, 2002: 40.6N, 73.8W (Long Island, New York). Ruby is back to her usual spot on the east side of Jamaica Bay. Mar 2, 2002: 40.6N, 74.0W (Brooklyn, New York). Spring is approaching, and even Ruby seems to be slightly restless. Today for the first time she was on the west side of Brooklyn, near the Verrazano Narrows bridge. Feb 27, 2002: 40.6N, 73.8W (Long Island, New York). As usual, Ruby reported to us tonight from the west end of Long Island. Feb 22, 2002: 40.6N, 73.8W (Long Island, New York). Ruby remains at her usual spot near Jamaica Bay. Feb 17, 2002: 40.6N, 73.8W (Long Island, New York). Amazingly, Ruby has now been on Long Island for nearly a full six months. With peregrines in Ontario already engaging in courtship, will Ruby become more active soon? Or has she perhaps already found and settled into a territory in New York? The coming weeks should tell. Feb 13, 2002: 40.6N, 73.8W (Long Island, New York). Ruby is closing in on a full six months of living on Long Island. Feb 8, 2002: 40.6N, 73.8W (Long Island, New York). Another report from Ruby's usual location on Long Island. Feb 4, 2002: 40.6N, 73.8W (Long Island, New York). Ruby is back at Jamaica Bay yet again. Jan 30, 2002: 40.6N, 73.7W (Long Island, New York). Once again, Ruby is reporting from slightly to the east of her typical location. Jan 25, 2002: 40.6N, 73.8W (Long Island, New York). Ruby is once again along the shores of Jamaica Bay on Long Island. Jan 21, 2002: 40.6N, 73.7W (Long Island, New York). Ruby today is just a bit to the east of her typical hangout. Jan 17, 2002: 40.6N, 73.8W (Long Island, New York). As usual, Ruby is near the west end of Long Island. Jan 12, 2002: 40.6N, 73.8W (Long Island, New York). Ruby continues to spend her winter along the shores of Jamaica Bay. Jan 7, 2002: 40.6N, 73.8W (Long Island, New York). Once again, Ruby is reporting in from her regular territory near Jamaica Bay. Jan 3, 2002: 40.6N, 73.8W (Long Island, New York). Ruby has entered the new year in her usual location at the west end of Long Island. Dec 29, 2001: 40.7N, 73.8W (Long Island, New York). As usual, Ruby's position has shifted only slightly since her last report. Dec 25, 2001: 40.6N, 73.9W (Long Island, New York). Ruby seems to be spending her Christmas just slightly to the west of her normal spot near Jamaica Bay on Long Island. Dec 20, 2001: 40.6N, 73.6W (Long Island, New York). For the first time in nearly a month, Ruby is away from her usual location. However, she is only a short distance to the east of Jamaica Bay, and this likely is just a short day trip away from home for her. Dec 16, 2001: 40.6N, 73.8W (Long Island, New York). Ruby is maintaining her usual position on Long Island. Dec 11, 2001: 40.6N, 73.8W (Long Island, New York). Ruby's reports from today varied somewhat in location, but the quality of the signal was not great, so it may be that she did not move as much as it seemed. At any rate, by the end of the day she was in her usual area. Dec 6, 2001: 40.6N, 73.8W (Long Island, New York). Once again, Ruby has reported in from her usual spot near the southwest end of Long Island. Dec 2, 2001: 40.6N, 73.8W (Long Island, New York). The start of December finds Ruby remaining in position near Jamaica Bay. Nov 27, 2001: 40.6N, 73.8W (Long Island, New York). Ruby remains near her usual position on Long Island. Nov 22, 2001: 40.6N, 73.7W (Long Island, New York). As of tonight, the readings from Ruby's transmitter indicate that she has swung back east a bit, this time overshooting her "usual" position by a bit and ending up a little east of Jamaica Bay for a change. Nov 18, 2001: 40.6N, 73.9W (Long Island, New York). Today Ruby again wandered over to the west side of Jamaica Bay according to her latest transmissions. Nov 14, 2001: 40.6N, 73.8W (Long Island, New York). Ruby's back to her usual spot along the southeast part of Jamaica Bay. Nov 9, 2001: 40.7N, 73.9W (Long Island, New York). Ruby was slightly northwest of her usual position today, but is still on the whole staying put. Nov 5, 2001: 40.6N, 73.8W (Long Island, New York). While several other Ontario peregrines have been very much on the move over the past week or two, Ruby is still staying put and seems to be quite content in New York. Oct 31, 2001: 40.6N, 73.8W (Long Island, New York). Once again, Ruby has moved little since her last update. Oct 26, 2001: 40.6N, 73.8W (Long Island, New York). While Lightning passed right on through New York, Ruby seems content to still remain in her corner of Long Island. Oct 22, 2001: 40.6N, 73.8W (Long Island, New York). Ruby is still in the same area on Long Island. We are curious to see whether she and Lightning will meet up now that they are both in the New York City area. Oct 17, 2001: 40.6N, 73.8W (Long Island, New York). Ruby has now spent nearly two full months on Long Island. At this point I would be surprised if she decides to move further south this fall, but peregrines have a tendency to surprise us it seems, so we will keep monitoring her reports regularly. Oct 13, 2001: 40.6N, 73.8W (Long Island, New York). Ruby is back to the core of what seems to be turning in to her territory at the southwest end of Long Island. Oct 8, 2001: 40.6N, 74.0W (Long Island, New York). It has been a while since Ruby made an appreciable movement, but today she reported from the extreme southwest tip of Long Island, roughly 20-25 kilometres west of the area where she has been for most of the past several weeks. Oct 3, 2001: 40.6N, 73.7W (Long Island, New York). Ruby has remained in the same area since her last report. Sep 28, 2001: 40.6N, 73.7W (Long Island, New York). Again Ruby appears to have adjusted her position slightly, but remains on the south shore of Long Island. Sep 24, 2001: 40.6N, 73.8W (Long Island, New York). Ruby's position remains relatively unchanged along the south shore of Long Island. Sep 20, 2001: 40.6N, 73.8W (Long Island, New York). Ruby has now remained on the south shore of Long Island for more than a month. Though she continues to move east and west along the shoreline for short distances, she has settled into a fairly small range. Sep 15, 2001: 40.6N, 73.7W (Long Island, New York). Despite moving a bit to the southeast today, Ruby still remains more or less in the same area, along the south shore of the west end of Long Island. Sep 11, 2001: 40.7N, 73.9W (Long Island, New York). By sheer coincidence, we received reports from Ruby today on the same day that chaos reigned in New York City. While we might have expected Ruby to distance herself from the explosions and billowing smoke, she actually shifted a bit to the northwest, ending up less than 8 kilometres from the carnage in south Manhattan. Sep 6, 2001: 40.6N, 73.8W (Long Island, New York). It appears that Ruby has shifted slightly further west again, but remains on the south shore of Long Island. She's now along the edge of Jamaica Bay. Aug 27, 2001: 40.6N, 73.7W (Long Island, New York). Ruby really seems to have settled in on Long Island. Today she moved marginally north from her last location, but still remains near the south shore. Aug 23, 2001: 40.6N, 73.7W (Long Island, New York). Tonight's report indicates that Ruby has moved only a short distance over the past four days, shifting about 10 km west along the south shore of Long Island. Aug 19, 2001: 40.7N, 73.6W (Long Island, New York). Ruby has continued her flight to the southeast. Throughout her transmission period today, she was stationary at a point along the south shore of Long Island, a bit to the east of the Jones Beach Causeway. Aug 14, 2001: 41.9N, 74.9W (Roscoe, New York). Ruby is on the move! A series of reports from Ruby today provided a fascinating documentation of her flight south through New York State. The first signal reached us from near Utica, New York, already more than 160 km south of Charleston Lake. Of course since our last report from Ruby came nine days ago, we have no idea how long it took her to reach Utica. However, today at least she was moving at a quick pace - over a four hour period, reports from her documented a journey of 180 kilometres, zigzagging slightly, but generally moving south /southeast in the general direction of New York City. The last report we received tonight placed Ruby near Roscoe, New York - though it's certainly possible that she kept on flying past there after the transmitter shut off again. It will be very interesting to see how much further she travels by the time of her next report, anticipated on the weekend. Aug 10, 2001: 44.6N, 76.0W (Charleston Lake). Again Ruby has reported from somewhere on the north edge of Charleston Lake. Aug 5, 2001: 44.6N, 76.0W (Charleston Lake). Though not seen as frequently as her siblings on some recent days, Ruby remains around the north end of Charleston Lake. Jul 27, 2001: 44.6N, 76.0W (Charleston Lake). Ruby remains content to stay at home for the time being, with coordinates again matching those of the hack box. Jul 22, 2001: 44.6N, 76.0W (Charleston Lake). Once again, Ruby's signals from this evening indicate that she is very close to the release site on Charleston Lake - and may well have been right at the hack box itself! Jul 18, 2001: 44.6N, 76.0W (Charleston Lake). Tonight's second report from Ruby confirms what visual sightings already indicated - she remains on Charleston Lake in the general vicinity of the hack box. Jul 13, 2001: 44.5N, 76.0W (Charleston Lake). Ruby was fitted with her new transmitter this morning, and within hours of being released, the first signals from it were being received, confirming her location near the north end of Charleston Lake. For details on the transmitter installation process, see the July 13 entry on the Leeds home page. Updates on her movements will be posted on this page regularly.